We’re hiring! We are so excited to announce that we’re searching for a new part-time Real Wedding Coordinator. Details and application requirements are listed below. We look forward to hearing from you! OFD Consulting is a Richmond, VA- based niche marketing and public relations agency that exclusively services the wedding industry. Current clientele includes a broad representation of some of the top wedding companies and experts in the market. For more information, visit us at www.ofdconsulting.com. We are looking to expand our small but mighty team with a part-time position. 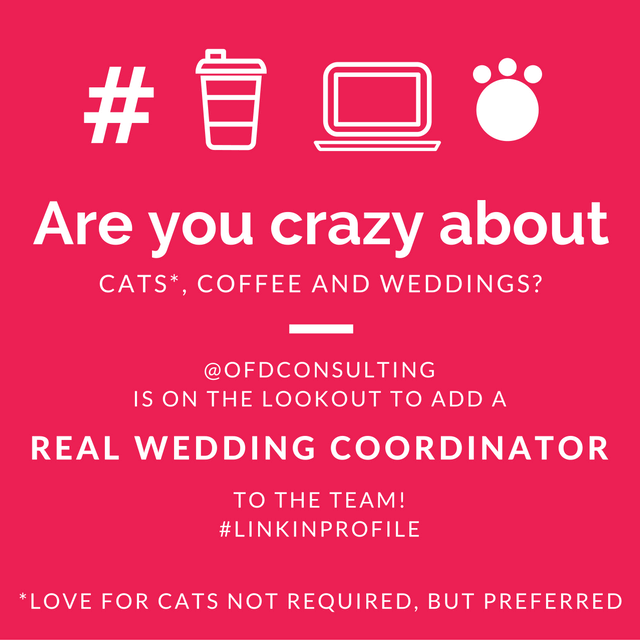 The Real Wedding Coordinator will be responsible for reviewing and curating images for real weddings, assisting in determining the media outlet(s) that is the best fit for each submission, writing up real wedding stories based upon the information received from couples, and maintaining regular communication with clients, couples and editors to ensure a smooth submission process. They will also be expected to provide administrative and staff support when needed. The best candidate for Real Wedding Coordinator is a driven, organized and detail oriented individual who values on the job experience. An understanding of basic marketing and public relations is preferred and strong writing skills are required. Previous blogging experience is a plus. Candidate must take direction well, although the opportunity to be creative will be prevalent throughout the time spent at OFD. Public Relations is often a fast-paced environment so the ability to think quick and “on your feet” is a huge bonus. Proficiency with Mac OS and Microsoft Office (specifically Word and Excel) is a must. Also, a proficiency in WordPress would be helpful, as well as some knowledge of SEO. 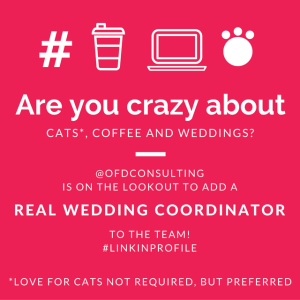 If you’re interested in the Real Wedding Coordinator position, please apply here. For questions, please contact us at hello@ofdconsulting.com. *Please Note: To successfully apply for the position, you must fill out the application. Emailed resumes will not be considered.